Our acumen in identifying successful short-to-mid-term options plays has been at a high level for years now, and this week has been no different than those that came before it. We’re looking at a pair of stocks this morning that have broken out, and that we’d like to monitor on the chance that they produce sustained uptrends. Leading Brands, Inc. LBIX - This was a fairly illiquid stock until just recently, when it broke out of a mundane pattern of low volatility and began a run into blue skies which lasted from Tuesday through Friday. We’ll stay wary of the possibility for course corrections, but a dip-and-rip scenario could definitely come into play here in coming sessions. The volatility has ramped up in a huge way, which is what we always look out for as swing traders. 22nd Century Group Inc. XXII – In the case of XXII, the stock has traded in a fairly predictable pattern over the past few months, during which time it has formed a solid upward channel. The company also recently closed a $54M direct offering at 2.65/share. We’ll look for this one to continue to build, keeping an eye on it as we kick off a new trading week. We also want to signal a couple of options ideas for Disney, which has a pretty nice bottom setup on the chart, trading near its lowest per-share pricing since December. For a near-term idea, we’re going to be looking at the DIS Weekly $96-98 Calls and the DIS 11/24 $98-99 Calls in the event of an extended recovery, which seems due at any time now. We had winners cropping up all across the board on Friday, with our options idea, as well as a couple stocks from our watchlist all having really solid sessions to close out the week, the month, and the 2nd Quarter. Nike, inc. NKE – We signaled our interest in a range of Nike calls, and were not disappointed in the results. Our targets were the 07/07 $55.50-57 Calls and they all posted considerable gains on the day. NKE wasn’t the first set of options ideas we crushed last week. We also tagged contracts in the DRI and CBI chains that subsequently went on multi-bag runs. As always, we strive to deliver a varied range of ideas for traders, and options are a huge part of that. Digital Power Corp. DPW - After tagging it in our watchlist in Friday’s premarket report, DPW had a very respectable intraday swing right out the gate that morning. The stock ran from a low of .65 and reached as high as 1.05, which represents a 62% pop. The stock couldn’t sustain more than half of that gain into the close, however it is trading up slightly in the premarket today. We’ll want to continue to monitor this play, watching for the building of higher base levels of support over the course of this short and divided holiday week. ShiftPixy, Inc. PIXY – Speaking of solid runners from Friday’s report that are showing signs of bullish premarket activity today, we’ve also got PIXY, a stock that IPO’d on Friday. A close contact in our vast network of traders gave us the heads up on the commencement of trading in PIXY, and we took the opportunity to pass it along to our readers by including it in our watchlist. We’re quite anxious to see how this new stock will progress from here, even if the timing of tomorrow’s holiday isn’t ideal. If PIXY continues to be a huge hit with the investment community, just remember, you heard it here first! Given the fact that it streaked to new all time highs to close out the week on Friday, we want to swing back around to pat ourselves on the back heartily for PNTV. However, even if you’re newer to our reports and only caught our most recent alert on PNTV on June 13th, you still had the opportunity for profits of up to 34% as the range in that time span ran from .0951 to the new high of.127. With the stock firmly blue sky territory, there’s no telling where this ride will end up! Additionally, Nevada’s recreational marijuana sales kicked off over the weekend, so that ramps up the intrigue with this play, considering the fact that the company was recently grated two licenses to supply recreational consumers in that state. Yesterday, despite the fact that the markets as a whole were on pace for the longest sustained backslide in more than half a decade, we still managed to see new highs in a few of the stocks we’ve been tracking. We also observed solid intraday performances from a couple other plays that were on our morning watchlist, so we’ll begin today with a quick roundup of all these movers. We signaled our interest in tracking DOLV in Thursday’s report, and at the time we’d witness the stock trading at a low of .0056. We circled back to MYDX, a stock we’ve tracked all the way from a February low of .001, last Wednesday, while it was trading as low as .0077. It too has put together a multi-day run leading to impressive new highs once again yesterday. The stock saw a daily range of .017-.0226, which represents an increase of 32% on the day, 193% from last Wednesday’s low, and a ridiculous 2160% from our witnessed low in February! Here’s another stock whose low (.014) came during the month of February, following our report on the 27th. We’ve been all over it since then , and in two sustained bursts it has absolutely soared. We placed a couple of plays in yesterday’s extended watchlist that didn’t blow our minds by any stretch of the imagination, but did log some solid intraday increases that warrant continued observation for each of them. BIND cropped up on our premarket scanner yesterday in the wake of a post-market PR on Wednesday afternoon, and it put forth a solid move early in the session. It traded as low as 7.40 at the open, and we then witnessed a significant 36% spike to the high-of-day at 10.04. According to the CEO, BIND expects 2015 “to be a particularly active period” with regard to the development of its many products, so this will be a play that we’ll want to monitor more closely moving forward. Toward the end of the session yesterday BIND pulled back, and is gapping once again in the pre-market, so we have our eyes peeled for any potential bounce action that could be used in our favor. 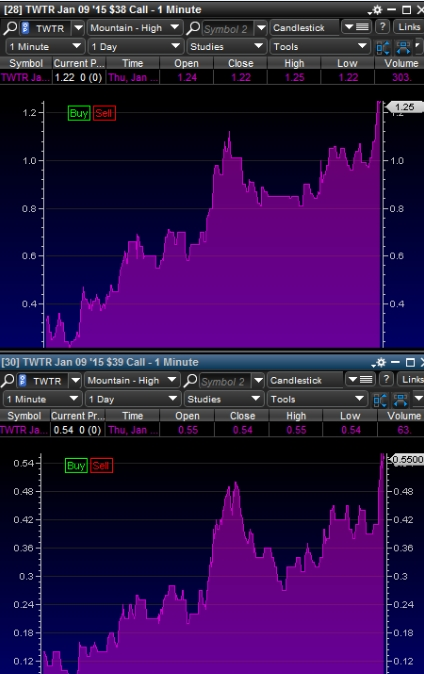 We’ve also got to update everyone on the options trading idea we put forth earlier this week for TWTR. We mentioned an interest in the Weekly $38 and $39 Calls, and each set of contracts showed us a huge spike during yesterday’s session. We also wanted to remind readers of the long-term options idea for TWTR we mentioned in the same report. The February $40 Calls could be in line for significant gains if TWTR continues to recover off of recent lows in the $35-36 range.